March 21, the first day of spring, and very appropriate for Britain’s “one small step, one giant leap” moment. Libya and Japan rightly dominate the news schedules, but in the longer perspective we will look back on today for the significance of keys handed over in a Hertfordshire car showroom. 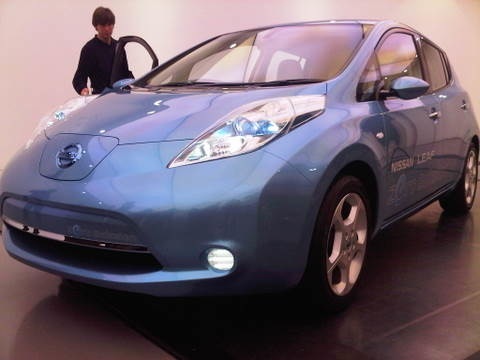 Nissan today began deliveries of the first 100% electric, mass produced, “affordable” family car, the LEAF, to customers in the UK. The truth is, we really are entering new consumer territory. Electric vehicles (EV) were briefly tried once before, in the 1970s, before being brutally mugged by Big Oil. (Who killed the Electric car?. See also Revenge of the Electric Car). Electric cars’ second coming has been marked so far by the very well-meaning but modest G-Wizz, and the rare and hugely expensive Tesla. The Nissan LEAF is the first conventional and potentially mass-market electric car to go on sale in Britain since the dawn of the automobile. It isn’t cheap, at £24,000, and it owners may struggle to achieve the promised 100 mile range on a single charge. And in the short term it will not make the slightest difference to the massive, and growing, output of CO2 by road traffic. Your chances of even spotting electric cars on the roads will be very low in the first year or two. They will be arriving at a barely noticeable trickle, compared to the flood of petrol and diesel-powered cars which the vast majority of us will continue to buy and drive. But it started today (Radio DJ Mark Goodier and electronics engineer Richard Todd were the first to take delivery of their LEAFs at Glyn Hopkin Nissan in Waltham Abbey, Hertfordshire), and this time Big Oil, and, just as important, Big Scepticism will not prevail over the electric car. Prices will come down, batteries will get better, range will extend and the economics of EV, if only as the second car in the household, will become irresistible to many more people, quite apart from the green benefits. Two years ago, before the Nissan Leaf was announced, EVs were no more than a worthy concept. 12 months ago there were only a handful of proposed models. Now we’re up to 12 or more serious electric cars to be delivered to showrooms by 2013, from the genuinely inexpensive, to the ultra luxury. There are optimistic targets for EV penetration all round the world, although it’s far too early to say if any of them will be met. That’s all for the future. What matters today is the objections are falling away. Prices at the petrol pump have become painfully high, and electric suddenly makes sense. Many people know they don’t actually drive more than 100 miles in the average day, and they drive still less in the second car, which is what the EV is likely to be for some years to come. The “average motorist” will , and perhaps sooner than we think, come to realise that cars like the Nissan Leaf perform very well, and will be won over by their clean and silent ways. There are much cheaper, and increasingly efficient conventional cars on the market, but the gap will reduce, and some years from now– perhaps five, maybe 10, almost certainly 15, the case for electric cars, first made today in the UK, will be irresistible. Previous PostLow-energy homes–old and new	Next PostCould the USA be in for a railway revolution?